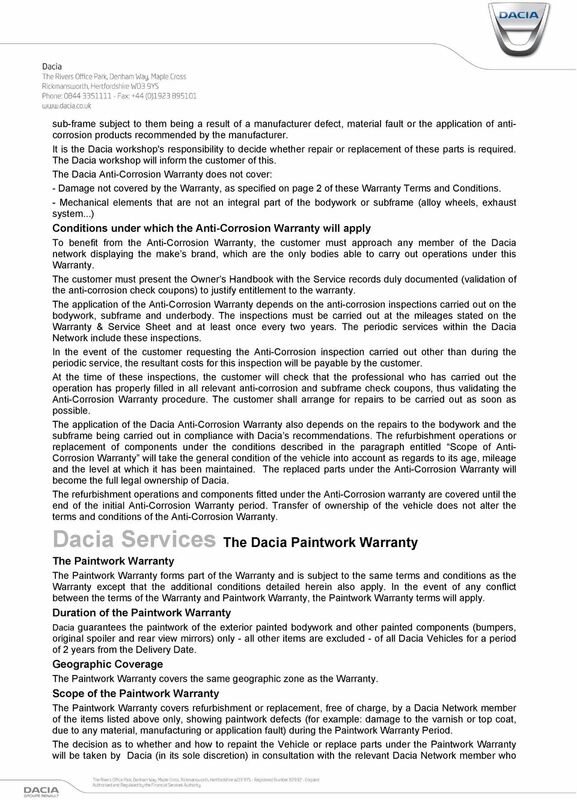 Download "Dacia Services The Dacia New Vehicle Warranty"
2 manufacturing defect recognised by the manufacturer when carried out by a member of the Dacia Network. It also covers consequential damage to the vehicle resulting from the principal defect. 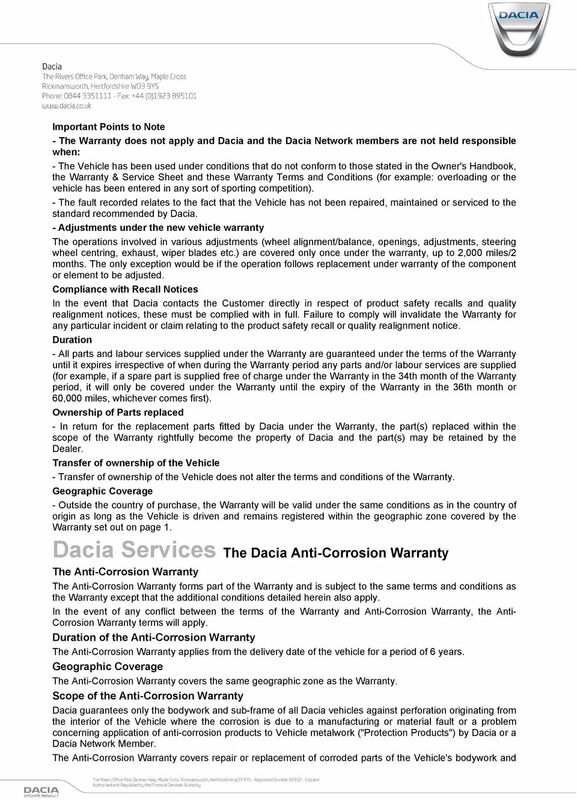 It is up to Dacia, in consultation with the relevant Dacia Network member, to decide whether it is appropriate in the circumstances to repair or replace any faulty part. - Emergency repairs or towing of the Vehicle to the nearest Dacia Network member. - Breakdown assistance services 24 hours a day 7 days a week under the conditions stated in the "Dacia Assistance" chapter of these Terms & Conditions. - The Warranty does not cover: - The indirect consequences of any fault (including but not limited to loss of business, length of time off the road) - Any components of the Vehicle that have been changed following the Delivery Date and the consequences (including but not limited to damage, premature wear, alterations) of such changes on other parts or components of the Vehicle or on the Vehicle's specifications. - Any routine servicing agreed with the Customer on purchase of the Vehicle, recommended by Dacia, detailed on the Warranty & Service Sheet (provided by the Dacia Dealer) or which the Customer chooses to undertake. - The replacement of parts damaged as a result of normal wear and tear. This includes (but is not limited to) items such as brake and clutch friction materials, exhausts, wiper blades and trim. However, such items are covered if replacement is required as a result of manufacturing or material defect. - The damage resulting from poor Vehicle maintenance, especially when any instructions concerning the treatment, servicing frequency or care to be taken with regard to the Vehicle detailed on the Warranty & Service Sheet or in the Owner's Handbook have not been observed. - Damage caused by the following: Accidents and resulting impacts (including without limitation) scratch marks, chipping caused for any reason Failure to comply with Dacia's recommendations as advised to Customers in any medium from time to time Effects associated with atmospheric pollution, effects of plant resin, effects of animal pollutants such as bird droppings, effects of chemicals Transportation of products The use of poor quality fuel, or any type of fuel other than the type that is recommended for use with the Vehicle in the Owner's Manual The fitting of non - Dacia approved accessories The fitting of Dacia approved accessories installed without following Dacia s recommendations as provided with the accessory or shown on the packaging or advised to the Customer by Dacia and/or the Dacia Network from time to time - Damage caused by events beyond Dacia's reasonable control, including but not limited to: Lightning, fire, floods, earthquakes, acts of war, terrorism, civil commotion, sabotage, vandalism, acts of God, riots and attacks. How does the Warranty work? - To benefit from the Warranty, the Customer must: - Make sure the Warranty & Service Sheet does actually show the Delivery Date for the Vehicle on which entitlement to the Warranty depends. 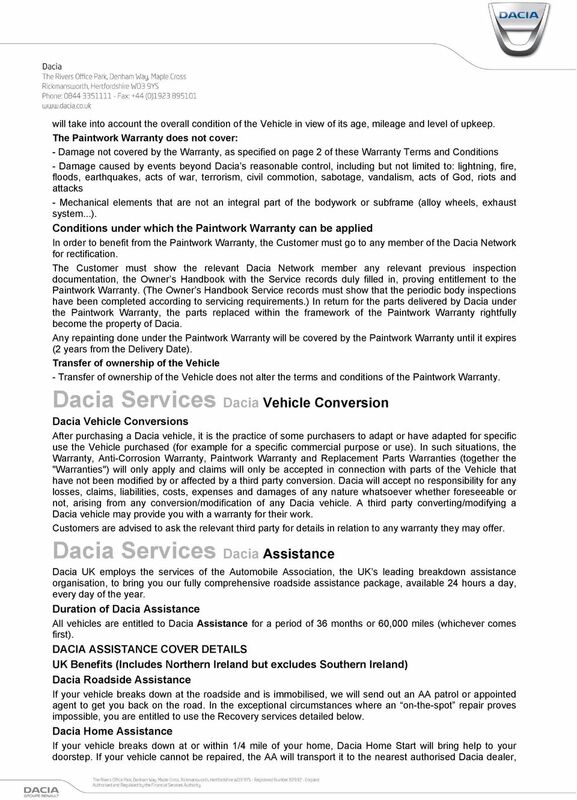 - Go to any member of the Dacia Network and authorise it to carry out work covered by and detailed in the Warranty. 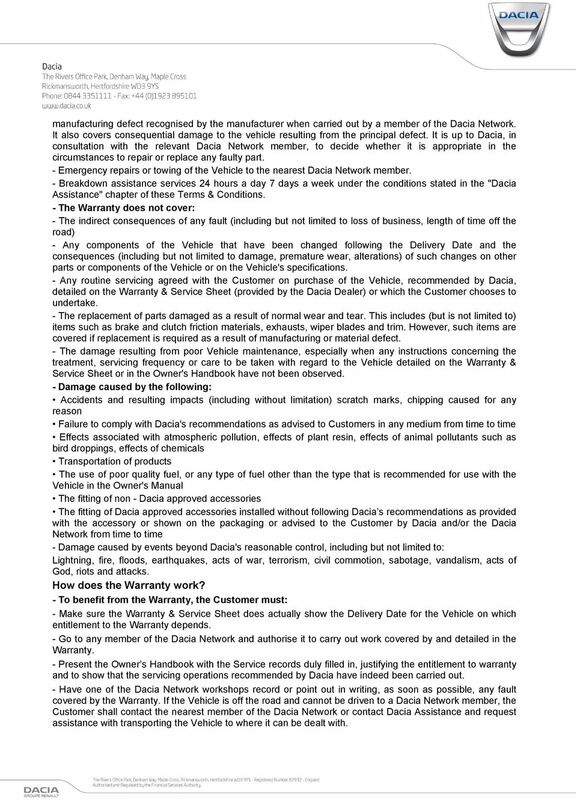 - Present the Owner s Handbook with the Service records duly filled in, justifying the entitlement to warranty and to show that the servicing operations recommended by Dacia have indeed been carried out. 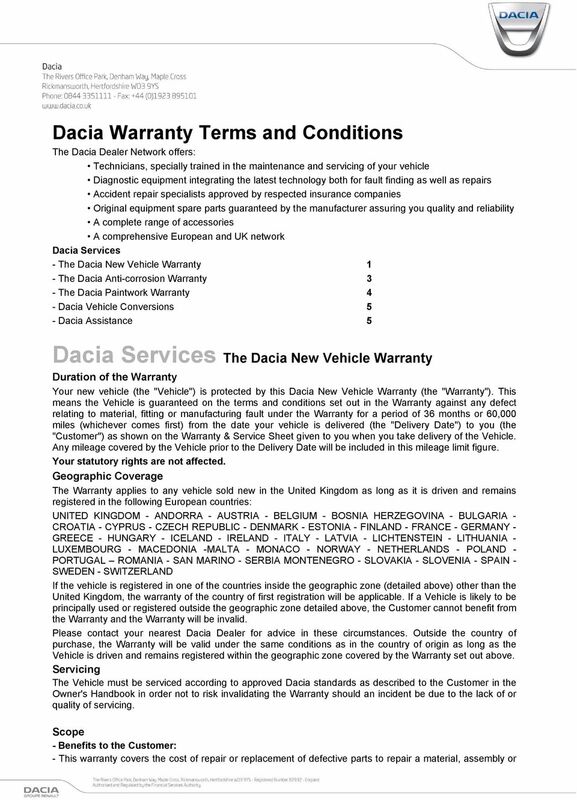 - Have one of the Dacia Network workshops record or point out in writing, as soon as possible, any fault covered by the Warranty. 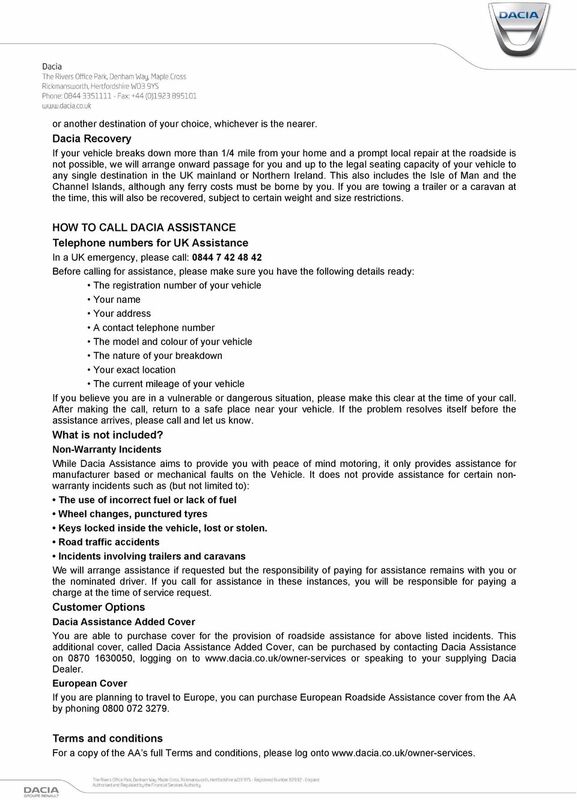 If the Vehicle is off the road and cannot be driven to a Dacia Network member, the Customer shall contact the nearest member of the Dacia Network or contact Dacia Assistance and request assistance with transporting the Vehicle to where it can be dealt with. >> Your Motor Insurance Policy. Insurance for your smart.